The McRib. The Great McRib. It is back! First of all, we need to get this out of the way. Is the McRib healthy? No. Is McDonald’s healthy? No. Is any of this supposed to be healthy?? NO!!! It is awesomely good, though. McRibs are great. McDonald’s is great. If you don’t think so, you are in the wrong place! Go away, haters. Fewd Snobs know what’s up! The McRib pops up occasionally. How often exactly? We can’t say. We can’t get a fast, clear answer. We aren’t researchers. That would take time away from our beers! The fact is, the McRib appears every so often. Really, this is genius marketing on McDonald’s part. People buy the hell out of them when they come back. If they were on the menu all year, there wouldn’t be any reason to flock to McDonald’s for them. Smart. We should say that we don’t know if these are available nationwide. The McRib is not currently featured on McDonald’s website. This is the time of year they come up, though. They are available in our area now. Naturally, we put down our beers for a hot minute and rushed to McDonald’s. Don’t worry, we only had one beer. And yes, you all know what a McRib is. But, as part of the announcement, we decided to review it anyway. It really is a magical box of goodness. 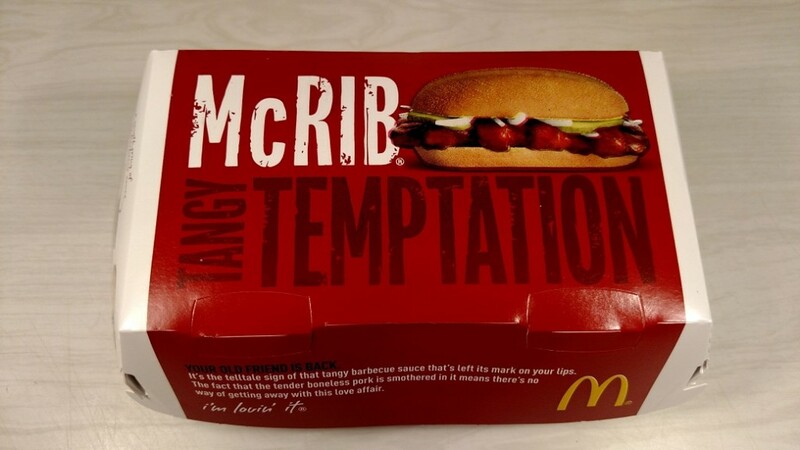 McDonald’s has had different options with the McRib over the years in terms of the meals. 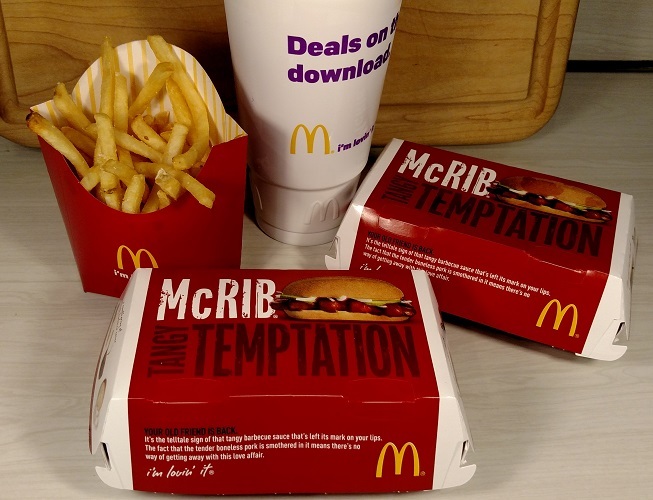 Sometimes, McDonald’s offers a second McRib for $1 if you buy the meal. We asked for the deal with the second McRib. Our receipt showed it as a “2 McRib Meal.” It comes with 2 McRib sandwiches, a medium french fries, and a large drink. Awesome. 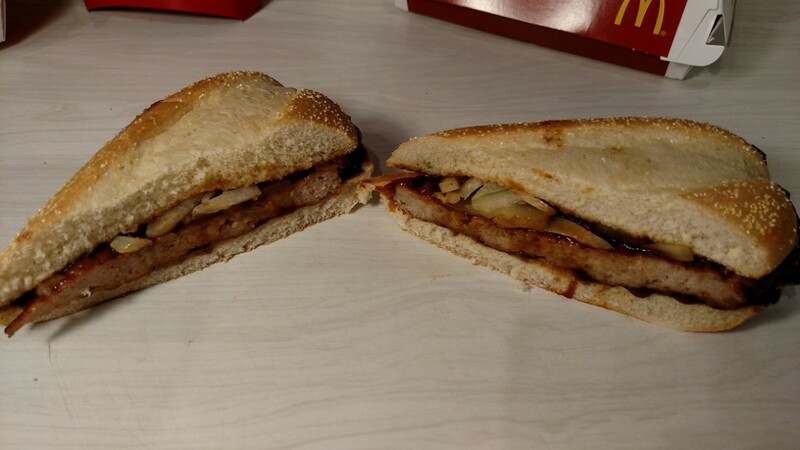 Amazingly, the McRib that you get actually pretty much looks like the one on McDonald’s website. Part of this is because the McRib comes in a box! Imagine that! It doesn’t get smashed!! We get smashed, but the McRib shouldn’t! No beer for you, McRib! 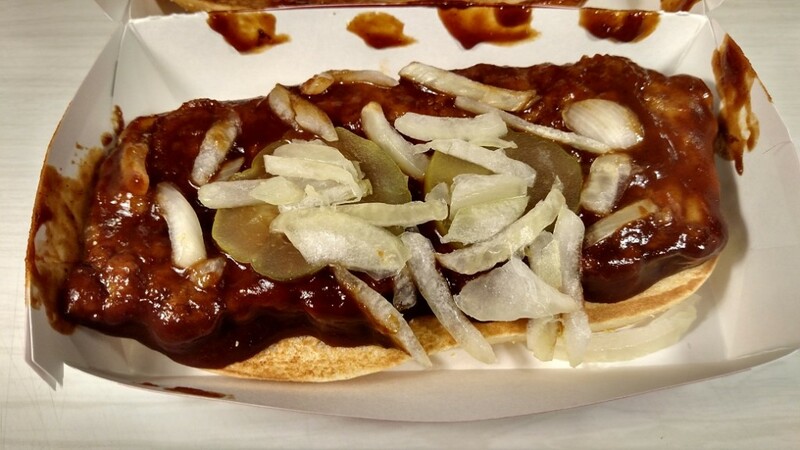 There are plenty of pickles, onions, and barbecue sauce on the McRib as you can see above. See our cool half-cut up there? Pretty nice. Give Herman the credit. We don’t want to go on another rant, but we must point this out. For all of those bitching about the McRib not being made of real meat, please go piss up a tree. 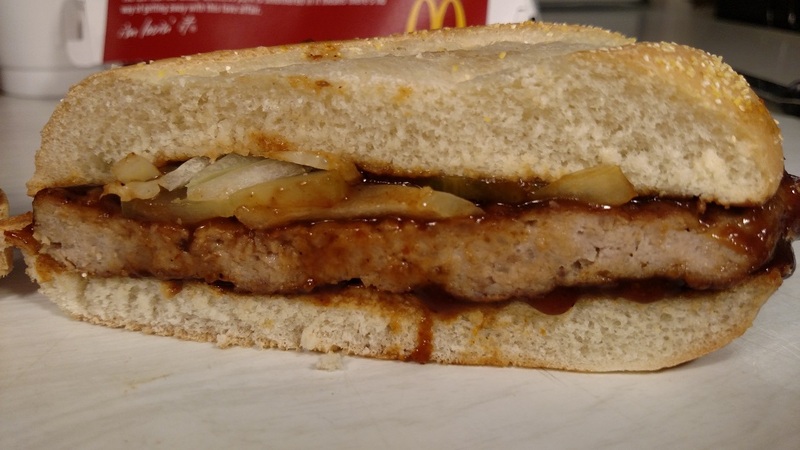 The McRib is basically a ground pork sandwich. It is kind of like sausage. Yes, it is formed into a patty that looks like a rack of ribs. That is just to make it look like ribs. It isn’t like McDonald’s is actually passing this off as a rack of ribs! Anyone that complains about any of this is goofy in the head. It is a pork sandwich. The pork patty is actually large. It more than covers the entire bun. In fact, it was hanging off of the bun on our test sandwiches. The patty is thick (HO HO!). It is much thicker than the small McDouble patties, for example. It is actually plenty of meat for a cheap price (more on that later). The flavor of the McRib meat is excellent. It is seasoned nicely. It is tender and juicy. There is a nice, strong pork flavor. Good stuff. The barbecue sauce has a nice, tangy flavor. It isn’t sweet. Neither of the Fewd Snobs like sweet barbecue sauce, so this makes us happy. There is also plenty of sauce on the sandwiches. Herman thinks there is an extra flavor that tastes kind of smokey. It reminds him of the flame-broiled taste that Burger King has. He couldn’t tell if the flavor was coming from the meat or the sauce. Denny doesn’t really detect that flavor. Herman checked out the ingredients on McDonald’s site. He found that the sauce has “natural smoke flavor.” So the flavor he is tasting is in the sauce. 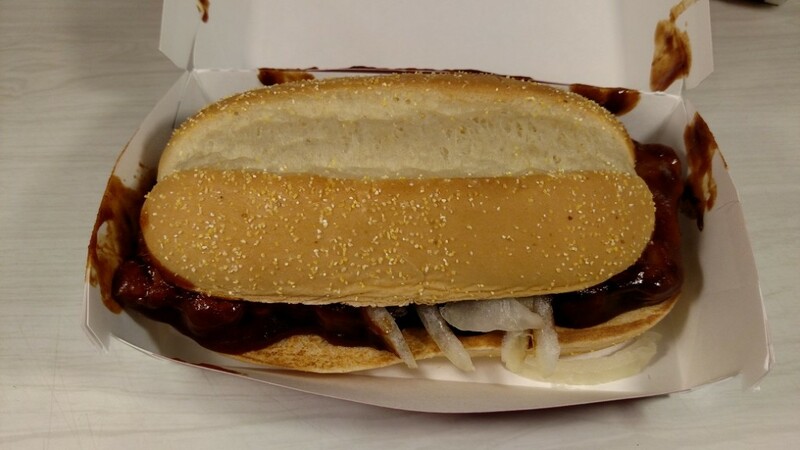 There are plenty of pickes and onions on the McRib. They add perfectly to the overall flavor of the sandwich. Overall, the flavors blend to make a great pork sandwich. Period. Finally, the price of the McRib cannot be beaten. There is a great value to it. 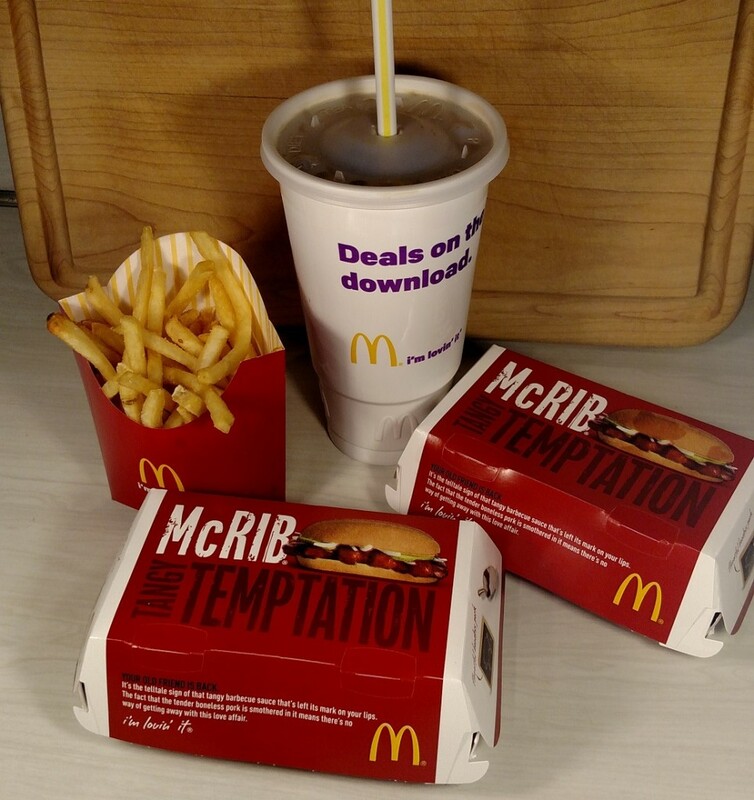 As we mentioned above, our area McDonald’s is now offering the “2 McRib Meal” consisting of 2 sandwiches, a medium french fries, and a medium drink for $6.39! Where are you going to get that much food for under 7 bucks? You won’t find a deal that tastes this good, and costs that little anywhere. The McRib is back, people. And it is excellent. We hope it is back wherever you are. Fewd Snob approved.